Chandan theatre is known to be an entertainment hub for Salman Khan’s fans. The die-hard fans of the star are known to gather there every Eid when the actor’s film releases and have a gala time dancing to Bhai’s songs and chanting and cheering his name. Sultan released today breaking all of Bollywood’s opening day records. The film was welcomed hugely by audience in spite of the exorbitantly high prices of its tickets. We have a video for you straight from Chandan theatre showing how heart-warmingly his fans have welcomed Sultan. The fans can be seen getting totally crazy over the new release. In the video, they are seen climbing atop the entrance of the cinema hall. 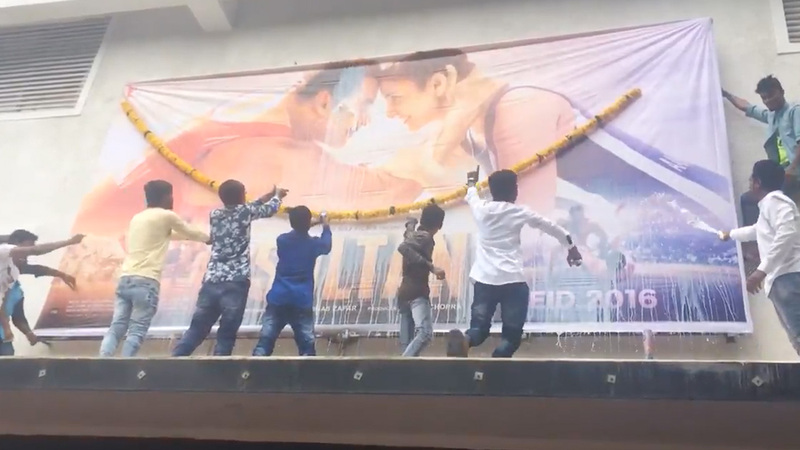 Having a garland adorned poster of the movie in the background, the fans are seen bursting crackers and shouting Salman’s name. The fans also went all out and started spraying milk on the movie poster. Last year, the fans at Chandan cinema were seen dancing to ‘selfie le le’ right at the screen while watching Bajrangi Bhaijaan. And to be honest, we really won’t be surprised to see any such jig again this year! Well, Bhai’s fans are Bhai’s fans and nothing can beat them when it comes to showering affection when a movie releases.